Crocodiles are often mistaken for alligators and caimans. While they are similar there are significant differences among them. Those differences are enough to put them all into different families when it comes to the scientific categorization. The snout is the biggest difference with the crocodile and the alligator. They are wider for the alligator so it has a U shape along the bottom of it. The snout of the crocodile is thinner. It forms more of a V shape along the bottom of it. This is the same type of look that a caiman has as well. Most people don’t want to get close enough to such animals to examine their teeth. Yet this is a key place too where you can note significant differences. With a crocodile the upper and lower jaw are almost the same size. You will be able to see the lower teeth as well as the upper ones when they have their jaw closed. 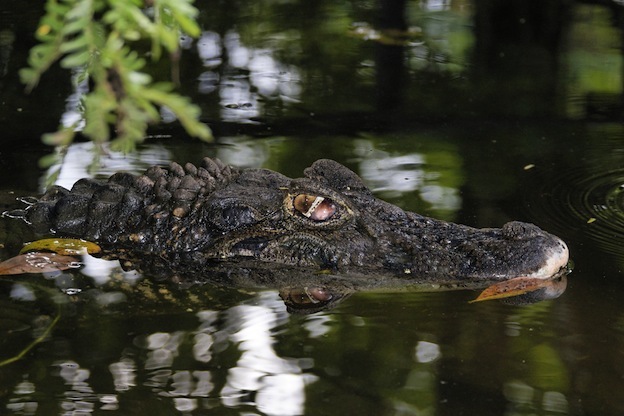 Alligators feature a lower jaw that is thinner than the top one. As a result the lower teeth are barely visible when they have their jaws closed. Both crocodiles and alligators have scaly skin and it is often similar in color. The shade can vary based on location as well as the species. However, with crocodile skin you will notice spots and dimples at the edges of the ridges it is definitely a crocodile you are looking at. Caimans don’t have those telling signs either. Crocodiles are the largest when it comes to overall size. Yet that can be hard to factor in as well. You may be looking at a full grown alligator and a younger crocodile so of course that could mislead you to think the bigger one is a crocodile. Different species of these animals are also different sizes. Caimans generally won’t be found to be more than 7 feet in size. Again though you really don’t know just by looking at the animal if it is full grown or not. It could very much look like a young crocodile or alligator. There are differences that can’t be seen on a physical level though. For example crocodiles are known to be highly aggressive in nature. Alligators are more low key and they are less likely to attack humans unless they have been provoked. Crocodiles can live in saltwater due to the glands found in their mouths. 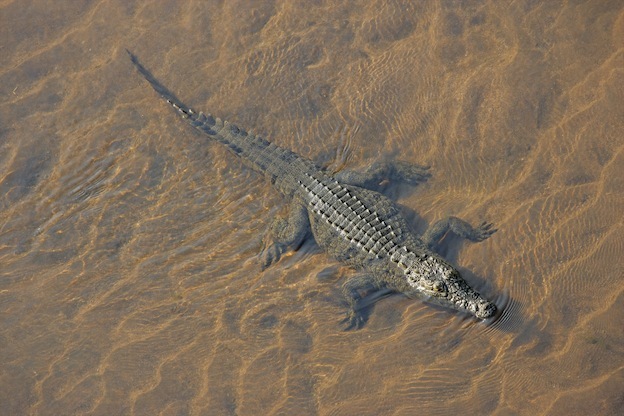 Alligators are usually found in bodies of freshwater and the caimans in both habitats. However, many crocodiles also live in fresh water so don’t rule their existence out in such areas. Caimans are often kept as pets due to the smaller size of them. They are illegal in the United States which only increases the demands for them. They are smuggled into the country all the time. Of course there are some individuals out there willing to push the envelop even further. They have kept crocodiles or alligators as pets. Being caught doing so can result in serious fines or jail time. If the animal is found to be in poor living conditions other serious charges can be filed as well. Getting photos of crocodiles, alligators, and caimans and comparing them with each other is a great idea. It allows you to see with your own eyes all of these significant differences that have been identified. Regardless of which reptile you come into contact with them do have many features in common. First, they are faster than most people think – especially in the water. Second, they are very fierce animals with sharp teeth and powerful jaws. Third, they are highly intelligent creatures that will do anything they must in order to ensure their own survival.